The solar industries in the last few years enter a new phase of its development, and are taking the leader role in the global industry. Here are the words from Mr. Ingmar Wilhelm, president of the European Photovoltaic Association (EPIA) “The important declining costs of solar panels, the validity of the ecological footprint and new innovative features are creating today’s good climate for investment in PV technology, … ,which is an increasingly important part of the world’s energy future” and the world’s solar energy too. Here are some testimonials by participants from previous 7th EE & RES Exhibition: Fink Georg (Gehrlicher Solar AG, Germany) said that Bulgaria is and will be a really interesting market, which is in the beginning of solar power; Oto Gazovic (Asemid Solar, Slovakia) added the exhibition met expectations with the number of exhibitors and interest of visitors from the region. Here could be found the Post-Event-Report-2011. Solar Energy technologies program was dedicated to clean energy challenge which aims to reduce solar project costs and future FiTs in the region. Following the keynote the leading solar companies discussed the feasibility of meeting these goals and what challenges lie ahead as they move forward with deployment. Many enterprise officials were discussing what steps they see in the solar market, and are being taken to incorporate green energy into operations and the broader economy. The presentations by recognized experts were about the challenge facing solar energy and the grid, as well as transmission electricity from solar array. Thermal concentration systems for solar power. The Forum will gather key players from the solar and renewables industry which will have a great opportunity to get latest updates and connect their business with the market of South-East Europe. The excellent solar irradiation indicators on the Balkans and the interest of leading companies in the sector led to launch the SEE Solar as a parallel event to the EE & RE Exhibition. Over 300 participants will present at both Exhibitions most up-to-date solar photovoltaic-, thermal- , bio-, wind- and hydro energy systems, electric vehicles, energy efficiency solutions, etc. Over 7 000 visitors are expected to get involved: manufacturers, installers, investors, consultants and specialists the sectors of renewables, power engineering, construction, ecology, finance, transport, etc. 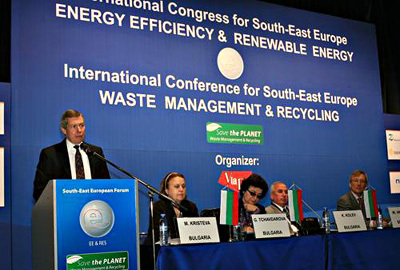 High-level speakers from over 20 countries will take part in the EE & RE Congress. Among them are experts from Euroheat & Power, World Alliance for Decentralized Energy, Deutsche Bank AG, European Forum for Renewable Energy Sources, European Council for an Energy Economy, ect. Over 300 attendees will discuss hot topics like financing projects, investment and trade opportunities, latest developments and challenges in green energy. 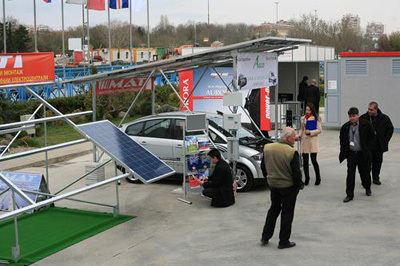 The event covers branches as Waste-to-energy, recycling of electrical, electronic, metal, solar PV waste, etc. Issues connected to environment today are highly prioritized in the worldwide, and also have priority for South-East Europe. 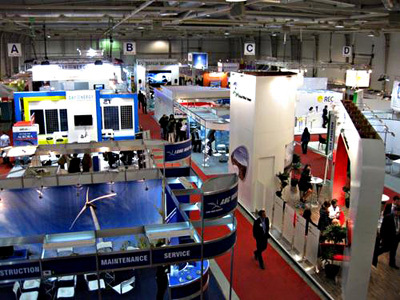 The Balkan region is in need of expertise, technology products and equipment, so that was a reason why the exhibition got a name “Save the Planet”. Project ideas will have the opportunity to be presented live to all participants the latest solutions in waste management, recycling and environment. It is a time to encourage the investments and creation of public-private partnerships! It will be offered to listen to presentations by keynote speakers, about legislation, financing, the latest information from market and their trends. Strategic Partner of the event is a group of participants from Austria. The exhibition has a jump in visits increased by 84 percent in 2011 compared to 2010.